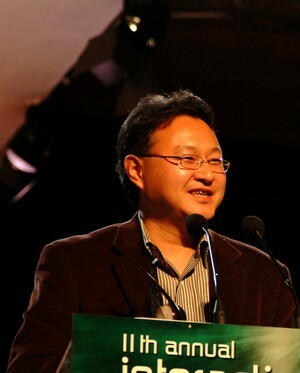 Shuhei Yoshida is a member of the Academy of Interactive Arts and Sciences where he serves as one of its board directors. He works for Sony. A: How many consumers have really enjoyed the games you were involved in creating. A: Time it takes to develop a game. There's no easy solution, but use of common tools, sharing knowledge base, a mindset of not reinventing a wheel would help. A: Tetris. The rule is simple enough so anyone, even someone who has never played a video game before, could understand it by just looking at someone playing it a minute or so. I cannot think of other games that can lead players into the "zone" easier than this game. Q: On a practical basis, what's the one thing you’re going to tackle next? A: Make games more social experiences. Game design so that social interaction is encouraged and social interaction can enhance the game play/reward. "Online play" is not the only way to achieve this, rather, people are usually busy so use of asynchronous communication is recommended for broader audience. A: Small is new big. Small teams are not afraid to try something unproven. Publishers feel more comfortable to let small projects tackle unproven concepts, giving a chance for innovation. Small projects can be quicker to respond to emerging trends in consumer's interest, too. A: Yes, for millions of people in the world. A: Become able to make games not for themselves. This is required for the industry to continue to expand the market. Developers have friends, families, relatives, etc, who are not exactly in the same demographic as themselves. By imagining how you can make these people enjoy playing your game, you can be as passionate as making games for yourself. A: Yes, to learn from good ones. A: People are more connected, always connected. This is totally exciting, game play can enhance the social experiences that drive people to connectedness. Game design to encourage social interaction with other players.